A couple of days ago, the temperature was in the mid 40s, and the night before was well below freezing. 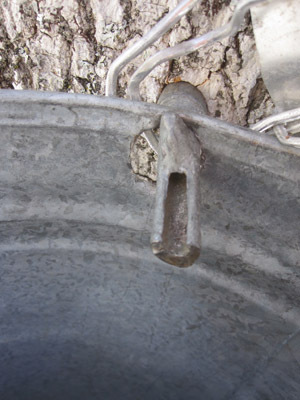 The combination that starts the maple trees flowing and keeps them flowing is just that… below freezing nights and warm days. Franco and I walked out to the sugar orchard during that balmy afternoon to see if the trees were going to wake up early this year. 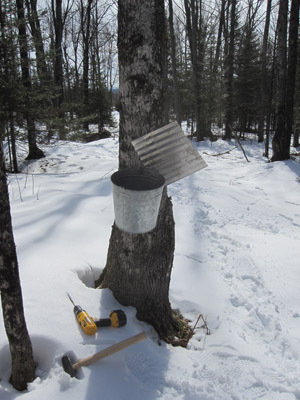 We brought along most of what we needed to do the work, and tapped our first tree of the year. As we walked out there, I could just feel the snap of spring in my nostrils. I had myself pretty convinced I’d have a gusher on my hands when I drilled the first hole of the season. Sometimes it works that way, and sometimes it doesn’t. I was kind of hoping it wouldn’t be time yet, because I’m still busy taking classes for the fire department. As usual, I have several other irons in the fire besides that as well. As I chucked up the drill, I really didn’t know what would happen. After I drilled the hole, I brushed away the sawdust and looked intently into the hole. It often starts slowly, and then really picks up steam if it is going to flow. I looked for a minute or so, and all I came up with was a dry tap. Now the plan is to visit each likely day until some activity is detected, and then tap the rest of the trees. This is a great time of the year. Those few hardy souls are sensing the beginnings of the growing season, and seem poised to get a jump on their competition. And we benefit with some sweet syrup. This entry was posted on Thursday, March 3rd, 2011 at 9:46 pm and is filed under Uncategorized. You can follow any responses to this entry through the RSS 2.0 feed. You can leave a response, or trackback from your own site.